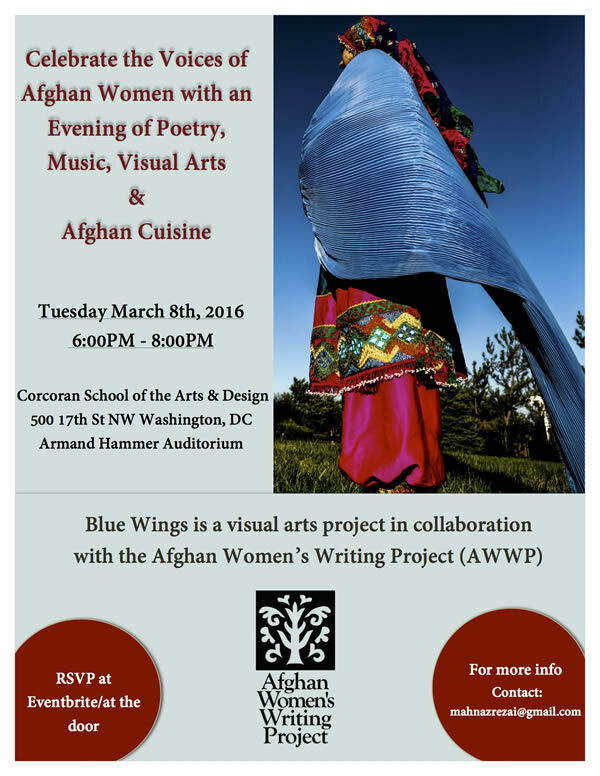 Join us this International Women’s Day for an evening of Afghan poetry, musical performance, and visual arts with Blue Wings and the Afghan Women’s Writing Project. Refreshments will be served. All donations will support Afghan Women’s Writing Project workshops for women and girls in Afghanistan. When: Tuesday, March 8, 2016 from 6 PM to 8 PM. TICKETS: $20 General Admission; $10 Student. Click to purchase tickets. The Blue Wings project brings together writers and artists of all disciplines to explore and make cross-national connections. The project is lead by the Corcoran School New Media Photojournalism (NMPJ) Master of Arts program in collaboration with the Afghan Women’s Writing Project (AWWP). Originally launched as a classroom-based project in Spring 2015, Blue Wings has expanded to include the entire university community. Photojournalism undergraduates and NMPJ graduate students were invited to read and respond to the writings of AWWP authors, all of whom are women residing in Afghanistan. The result is an exciting launch of virtual conversations between the writers in Afghanistan and photographers at the Corcoran, as they exchange their work and inspire each other online. Founded in 2009 by American journalist Masha Hamilton, the Afghan Women’s Writing Project strives to give women the basic human right to tell their own stories – a right that has too often been denied. Through online writing workshops led by international writers, educators, and journalists, AWWP empowers women in seven of Afghanistan’s 34 provinces. Poems and essays are published in an online magazine that carries the writers’ voices to a global audience.